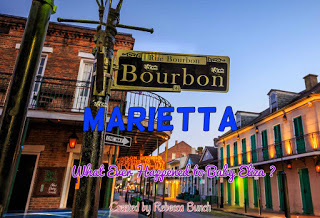 The TV Ratings Guide Marietta Marietta TVRG TVRG original Marietta Season 1, Episode 9 - What Ever Happened to Baby Eliza? Marietta Season 1, Episode 9 - What Ever Happened to Baby Eliza? There is a knock at Martin and Patty Lynn’s door. Patty Lynn: I’m coming! Give me one minute! Patty Lynn opens the door. Patty Lynn: Oh my god! Martin: What is it Patty Lynn? Eliza: Hi Aunt Patty Lynn! Patty Lynn: Just know that we never forgot you. Eliza: I know. I was just so ashamed about being a divorced teen mom that I just had to get away. Patty Lynn: Why didn’t you call? Or come back? Eliza: That’s why I’m here. I needed to reconnect with you guys. Patty Lynn: Come in. It’s time. Meanwhile, at Marietta’s house, she hears her phone ring. Marietta: What’s going on, dad? Martin: It’s your cousin Eliza. She’s back in town. Marietta: Oh wow. I never thought I’d see her again. Martin: Your mother doesn’t know I’m calling you. Act shocked when she calls you. Martin: Because I think she’d really like to be to one t break the news, but I wanted to prepare you. I know you have some strong thoughts about her. Marietta: I really do. She betrayed me and this entire family. Martin: I know she did, but I think she’s trying to be better. Marietta: Well that’s nice. But it’s not going be that easy for me to forgive her. Martin: Okay, that’s so sweet of you. Marietta: Bye dad, I’ll be anxiously awaiting mom’s call. Martin: Alright, she’s home. Let’s go. Eliza: Is Marietta gonna be angry? Won’t she feel betrayed? Patty Lynn: She will be, but she’ll get over it. I know my daughter. Eliza: Are you sure? Because when I didn’t invite her to my school play when i was ten, she didn’t talk to me for a week. She was thirty years old then. Martin: She was just having a bad week that week. And most weeks at that point. Eliza: I guess we should go then. Rip the bandage off now. At Marietta’s house, Marietta hears a knock at her door. Marietta: Dad, why are you here? I just talked to you like twenty minutes ago. Martin: Marietta, it’s time to forgive and forget. Eliza: Come on! Don’t leave us out here! Eliza: We have to talk! I’m not going away! Aunt Patty Lynn! Why are you in the car? Patty Lynn: I didn’t see this coming. She’s very angry, she ain’t letting us in. Patty Lynn: It’s not worth it. Maybe tomorrow. Marietta: You know what? You can come in. Marietta: Yes. I want you to explain yourself to me. Mom, you’re coming in too. Patty Lynn: Okay, I’m one with that. Marietta: Guess not. Come on you two. Eliza: Oh, we’re getting right into it. Marietta: You bet. So I hope you know how hurt I was when you left in the middle of the night 17 years ago. Eliza: I’m sorry. I was so ashamed. At first because I was 16 and pregnant and divorced! So I went to live with my aunt in Virginia. Then I was ashamed at the way I abandoned the family. I’m so sorry. Marietta: I didn’t know. I thought you just didn’t care. Eliza: No! Never! I thought about you guys so much. Patty Lynn: I just want to say that, from an onlooker’s prospective, this is very beautiful to witness. I’m crying! Eliza: This is really amazing I never thought it would feel this great to be together again. Marietta: I know! I’m so happy! Eliza: Tomorrow, would you like to meet my family? We have a lot to catch up on! Marietta: Of course! Let’s meet at the mayor’s mansion. I’m sure Milton would love to see you as well! Milton: Oh my god, Eliza! It’s been so long. And you brought kids! And your friends? Eliza: My wife and son-in-law. Milton: Oh, so nice to meet you all! Patty Lynn: I’m also here! Marietta: We’re the third wheels, mom. Patty Lynn: Can there be two? Wouldn’t it be a third wheel and also a fourth wheel? Eliza: This is my wife Elena, my daughter Henrietta guys, and Henrietta’s daughter Charlotte and boyfriend - sorry, husband Mason. Henrietta: Oh Charlotte, you keep dropping your pacifier! Mason: Let me take her back to the hotel, I think she’s sleepy. Eliza: Oh yeah, we are! We’re just still trying to find an apartment so we’re staying at the Hotel De L’eau Vive. Patty Lynn: The Hotel De La Whatnow? Eliza: De L’eau Vive. It’s very nice, but we really need a place to call our own. Milton: I can change that. There’s a very nice bungalow that I used as a campaign headquarters. But I’m retiring from public life, so you can live there. Free of charge! Eliza: Oh, that’s so sweet! I guess we’ll take it. Marietta: I think we might have to help you fix it up before you move in. It’s a bit of a mess. Eliza: Well Milton’s always been a bit of a mess! Marietta: Oh I’ve missed you! Milton: Good to see nothing’s changed between y’all. Patty Lynn: Please, remember that I’m here! Patty Lynn: I am sitting! Milton: Not what I mean! Marietta: What is it Tammy, I’m really busy catching up with my family. Tammy: Remember when I told you that there would be a mayoral debate soon? Tammy: It’s on Friday. So we gotta start practicing right now! Marietta: Oh my god!!! What the hell??? Marietta: I’m sorry Eliza, I gotta go! Eliza: Oh that’s fine! We’ll catch up later. Patty Lynn: I just noticed it, but Eliza’s accent is gone. That’s sad. Milton: What a random thing to say, mom.